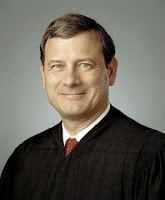 So, the new Supreme Court led by Chief Justice John Roberts has had a lot of 5-4 decisions lately, signifying that this Court is conservative-leaning. A guy at work told me that he hated all of these decisions lately. I asked him whether he just hated the result or the logic and judicial reasoning behind the decision as well. He replied, "aren't they one in the same?" My contention is no. Frankly, I would be elated if a Supreme Court justice in his majority opinion said, "Man, I really hate this outcome. But, the law is crystal clear on this. So, I have to judge it this way. But, I suggest our congressmen and women look into this and see if a new law needs to be created." I would make that person king. Oh wait, if they're already on the Court, they kind of are? I also would be thrilled to hear that from a judge. For two reasons. One, because it seems all too often that justice and the law are at odds, and in those cases, it would be nice to hear a judge admit that while the law was followed, he/she felt that justice was not done. Two, because that statement by a judge would imply that no personal bias entered into the decision and that the case was judged solely on its merits, which appeals to my logical leanings. I think I remember reading a couple of Supreme Court opinions like this in Constitutional Law class. Problem is I have a feeling that they are few and far between. Some of it might have to do with judicial philosophies naturally feeding into political ones, but they can't be as universal as they seem with this court, on both sides, at times.